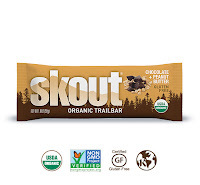 Scout Natural Foods is a company that makes different flavors of organic trail bars. I was sent some of each of their bars including cherry + vanilla, apple cinnamon, chocolate coconut, chocolate peanut butter and blueberry almond. My favorite bar was the chocolate peanut butter bar. This bar contains dark chocolate, peanuts, almonds, dates and oats. I like the texture of the bar with the crunchy nuts in it. The bars are organic, gluten free, GMO project verified, vegan, dairy and soy free. One bar has 190 calories, 5 grams of protein and 4 grams of fiber. My other favorite bar was the apple cinnamon. Along with apples and cinnamon, this bar is filled with dates, oats and almonds. I like the chewy texture of the bar and thought that it was pretty filling. This bar has 180 calories, 4 grams of fiber and 3 grams of protein. Caloriewise, this is perfect. I like the amount of fiber in the bar but wish that there was some more protein in it. I would use this bar when I need a boost of carbohydrates since one bar has 33 grams. These bars are available for sale on Amazon.com at a greatly reduced price. Check out the links below if you are interested in trying these bars. The giveaway will be for a sample pack of Skout bars to two readers of The Nutritionist Reviews blog. Organic Cherry - Vanilla Trailbar sounds good to me.